We are all about treats when it comes to Halloween! Our newest word search is, too. We have hidden the names of some popular Halloween candy treats in the word grid and it is up to the kids to find them all – words can be hidden going up, down, back, forth or on the diagonal. 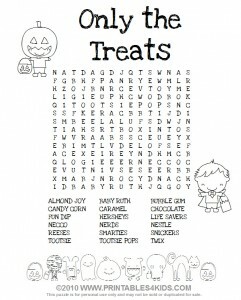 This Halloween word search is perfect for Halloween parties, Trick-or-Treat bags and even classroom activities. Don’t miss the rest of our Halloween printable coloring pages, classroom activities and puzzles! PS – thanks to MTF for the cute little Halloween critters in the activity sheet. Very cute. I’ll be sure to print this out for the second grade class.